In 1978, a remarkable coincidence occurred. 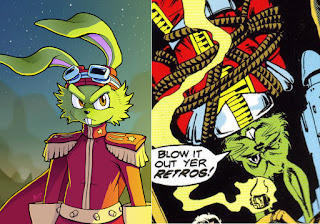 Within months of each other, two ray-gun wielding green anthropomorphic rabbits wearing red and yellow space suits simultaneously appeared in comic books: Bucky O’Hare and Jaxxon in the Marvel Star Wars comic. I have always been fascinated that such a creative confluence could occur. Both creators (Larry Hama and Roy Thomas) were working in Marvel’s New York office at the time and yet both of them claim that neither knew what the others were up to. Either way, these two lovable leporidae were a big influence on my childhood science-fiction tastes. And when I created Rayguns and Rocketships, I knew I had to include another raygun-wielding green rabbit. Thus, Jack Blacktail was born! 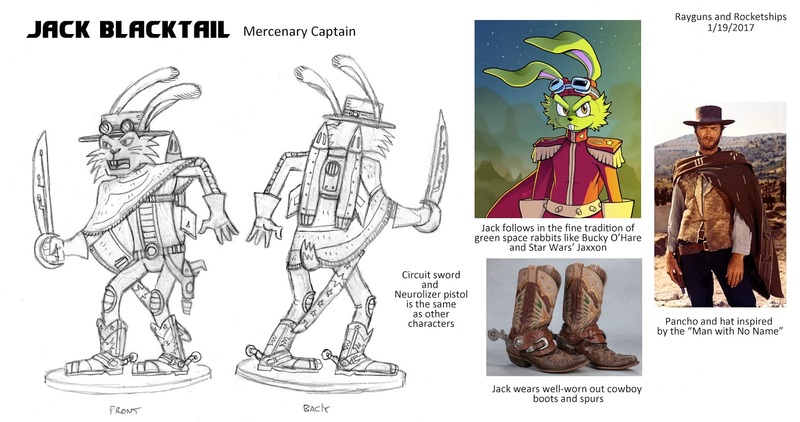 Jack Blacktail is a lepine mercenary captain known for his bravado and daring escapes. He often leaps into action before he looks – but his ability with a neurolizer pistol allows him to shoot his way out of danger. His two captain card builds showcase Jack’s quickness whether with his neurolizer pistol or his oversized feet. Hop to it: allows Jack to move over obstructing tokens and crew members and they do not count as spaces when moving. 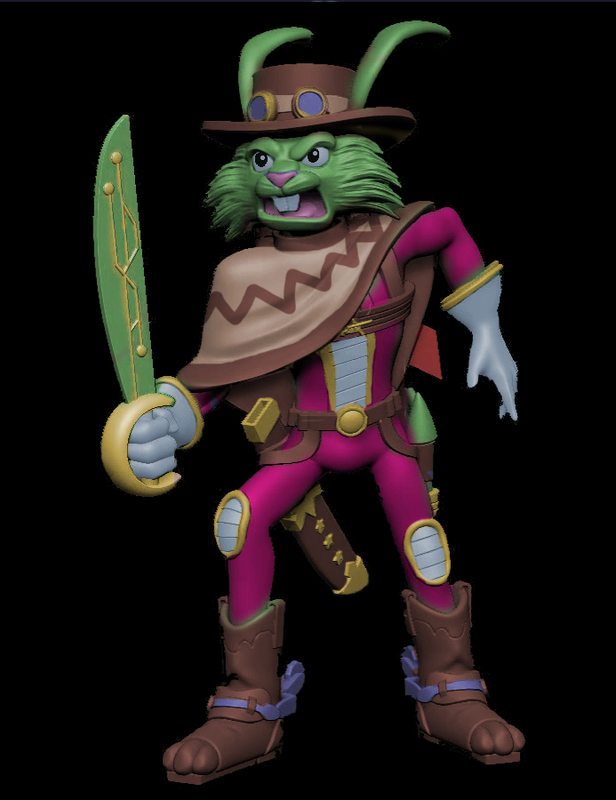 Which means blast tokens or blocking enemies are no obstacle for his quick-footed bunny! He’s even more deadly with his Doubleshot ability. Once per turn, if Jack Blacktail makes a successful ranged attack, he may follow it up with a second ranged attack as a free action. This quick-shooting Captain can make short work of a crew or blast up the rayguns on an enemy ship in no time. These abilities coupled with his captain’s health of 3 makes him a character to be reckoned with! 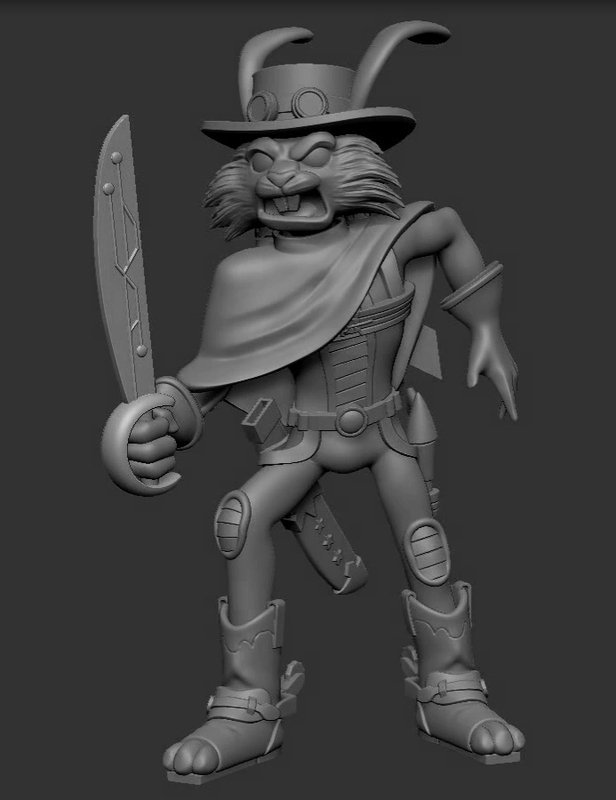 Stay tuned for more characters from Rayguns and Rocketships! There’s not much time left! Back today! ← Rayguns and Rocketships Goes to Kingdom-Con!